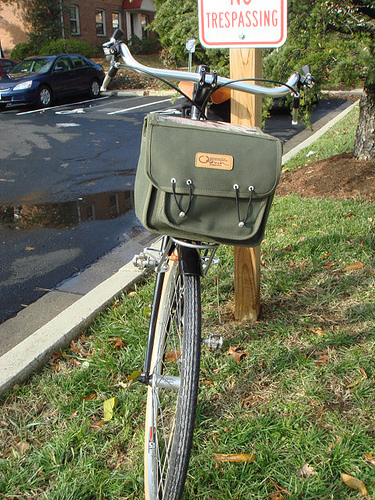 This weekend I completed my initial build and took a test ride on my new Kogswell Porteur/Randonneur. Kogwell is the company owned and run by Matthew Grimm in Minnesota. He periodically imports his own brand of steel framesets, forks and accessories — including three-speed internal hubs — and sells direct or through a small network of dealers. He has previously sold lugged road and fixed/singlespeed frames, but is now concentrating on the tig-welded P/R. Most of his framesets are pre-sold, and I emailed and called during the summer to make sure I got a 59cm, 650b model when they arrived this fall. The P/R comes primarily as a 650b wheel frameset, but he is also supplying 700c and 26″ wheel versions. Matthew offers three different forks that are raked to achieve low, moderate or relatively high trail. 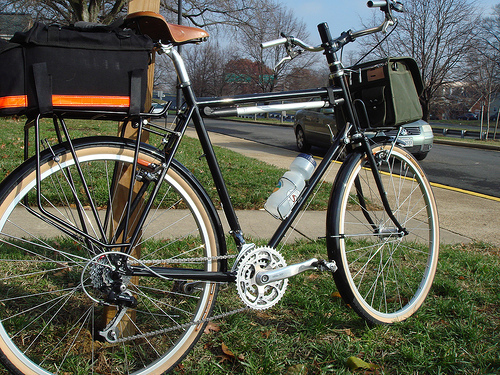 Low trail translates into steady handling with heavy front loads — making it a porteur bike. 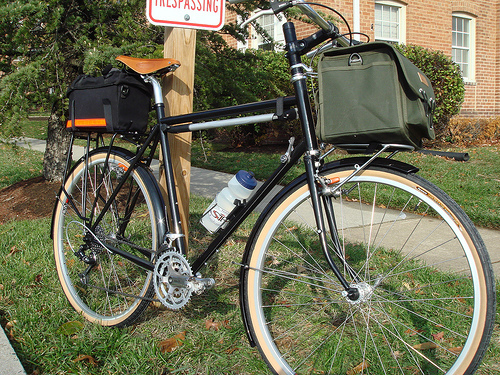 Moderate trail favors weight both front and rear, making it a fine randonneur bike, and the higher trail works best with weight in the rear. Most racing bikes have high trail; many MTB bikes have really high trail. I wanted a city bike that I could take on centuries and brevets, so I chose the moderate trail fork. I set it up with as many parts as I had on hand and had my buddies at the Bailey’s Crossroads REI install a new headset. They also moved the cranks and bottom bracket from a Cannondale MTB frameset I sold to a randonneur friend. They will cut down the steerer tube when I’ve set up the bars and stem to my liking. 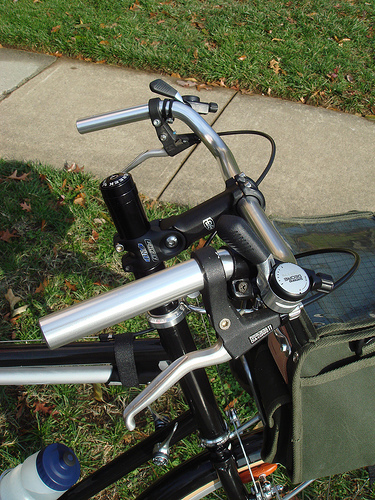 I installed Nitto Promenade bars with new old stock Deore 7-speed thumbshifters. 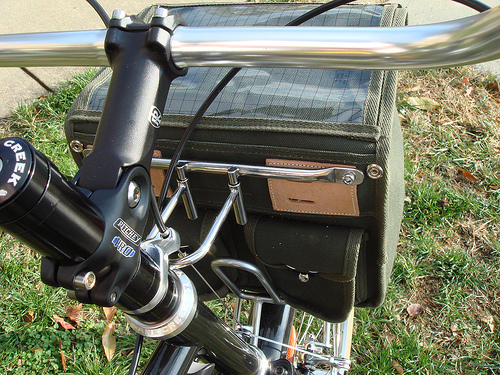 The Ostrich handlebar bag and decaleur (bar bag mount) from Velo Orange in Annapolis are supported by a Nitto M12 front rack. The used Dia-Compe brake levers came from Bikeman in Bath, Maine. Underneath I installed new old stock Shimano XT II wide profile cantilevers with Kool-Stop Salmon pads. The tires are Panaracer Col de la Vie 38mm on a set of budget prebuilt Sun CR18/Shimano Nexave hub wheels from Velo Orange. You’ll notice the bike has downtube shifters installed. I put both sets of shifters on the bike to test their usability. I wanted to keep the downtube shifters for simplicity and looks, but the reach was too great. After the test ride I removed them and cabled up the thumbshifters. Next I have to find some leather grips to round out the cockpit. The Ritchey 120mm adjustable stem is perfect for this type of exercise. I ended up lowering it on the uncut steerer tube and resetting it to 90 degrees. The Promenade bars require a longer stem than I would have guessed due to the rearward sweep. In these photos we see a fair amount of 1990s technology. 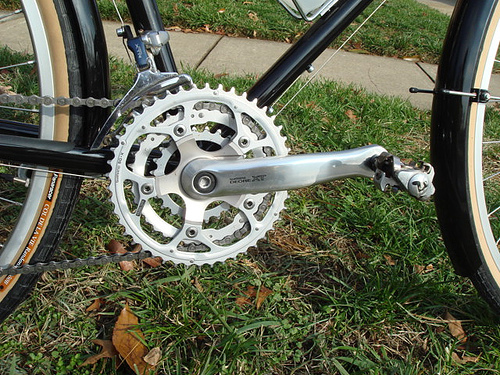 The crankset is the Shimano XT that came with the replaceable spider. I bought it because it takes versatile 110mm outer rings and 74mm inner. It has the original 26-36-46 Shimano rings. The M900 XTR front derailleur is my favorite for chainrings up to 50 teeth, it works quite well with friction shifting. I pulled the pedals off and replaced them with the new Shimano smooth/SPD A530 pedals. The second photo shows the Tubus Cargo rear rack, Carradice Super C rack bag, Shimano LX rear derailleur and wide Brooks B68 saddle. It was only coincidence that the derailleur matches. The cogset is a Shimano 7-speed 13-28. 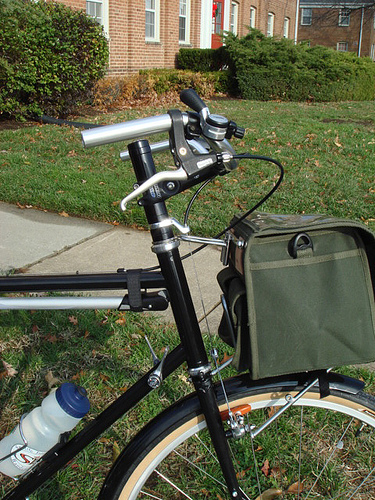 Fenders were supplied with the frameset and required drilling and leather washers to mount them under the fork crown and rear brake bridge. I probably could have used the Cargo 26″ version. I installed the 700c model and it sits a little high. Then again, the height may be better if I use my large Ortlieb pannier bags. I rode it over to REI and back and loaded up both bags, and found it to be a fun ride once I lowered the stem and put the bars more forward. It was easy to ride no hands with a loaded front bag once at speed. There is plenty of room for the cantilever yoke in the rear and I was able to set the brake arms straight out. They stop the bike quickly and smoothly. I’ll post an update with the final build. I’m not convinced the front aluminum fender is going to work well with just one stay on each side. Over sizeable bumps it touched the tire and rattled, but I think it might be an installation issue. Also the Ostrich bag popped out of its decaleur mount once, going over a speed bump, and I’ve added a velcro strap to keep it in place. I’ve posted these and a couple more photos to my Flickr page. See them all Here. thats cool…I like the Ostrich bag.